A distinctive period detached Grade all listed property (believed to be C18 or early C19) with four bedrooms, two bathrooms and three garages. Flint Cottage is situated within an Area of Outstanding Natural Beauty. Flint Cottage is an elegant double fronted riverside property situated in a prime position at the heart of Shoreham Village. Flint Cottage has ornamental elevations of flint set in red brick with an interesting stone bust above the front entrance. 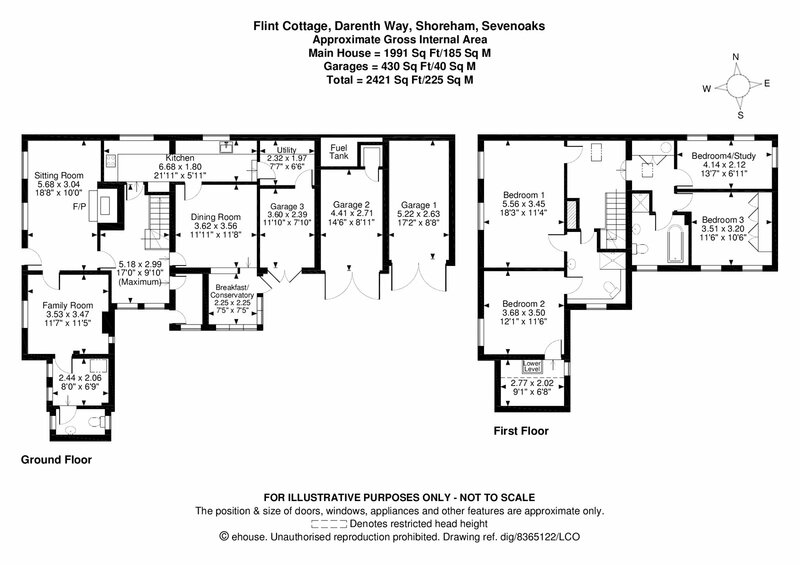 The accommodation is set over two floors and is exceptionally spacious and has an interesting versatile internal layout. On the ground floor there is a spacious reception hall, dining room, sitting room with log burner, a family room, study, conservatory, kitchen, utility room and cloakroom with four bedrooms and two bathrooms on the first floor. Externally, there is a secluded courtyard garden stocked with a variety of specimen trees and shrubs, a pergola above a flagstone patio and three garages. Flint Cottage has oil fire central heating and mains drainage. Front & Side Retaining flint wall with pedestrian gate. Brick pillars with ball finial and double wrought iron gates. Cobbled drive. Specimen trees and shrubs. Established climbing shrubbery. Secluded courtyard garden. Paved patio with timber pergola above. Flower beds. External lights. Doors to three garages. Door to porch. Reception Hall Door to porch. Double aspect windows to front. Exposed beams. Radiator in fretwork cover. Wood floor. Wall lights. Under stairs storage cupboard. Chimney recess. Stairs to first floor. Dining Room 11'11" (3.63m) x 11'8" (3.56m) (3.62 x 3.56). Flagstone floor. Sliding doors to conservatory. Wall lights. Radiator. Exposed beams. Door to kitchen. Kitchen 21'11" (6.68m) x 5'11" (1.8m) (6.68 x 1.80). Double aspect windows to front. Part tiled walls. Exposed beams. Wood strip floor. A comprehensive range of Ivory base and drawer units with polished wood worktops running above. Inset 'Belfast' sink with mixer taps. Integrated dish washer. Four ring ceramic hob with stainless steel extractor above. Fitted unit housing microwave and oven, storage above and below. Wine rack. Vegetable basket base unit. Radiator. Latched door to hall. Door to Utility room. Utility Room 7'7" (2.3m) x 6'6" (1.98m) (2.32 x 1.97). Space for washing machine, fridge freezer and tumble drier. Door to Garage. Sitting Room 18'8" (5.7m) x 10' (3.05m) (5.68 x 3.04). Double aspect windows to front. Door to front. Exposed brick fireplace with bressummer beam above and log burning stone on brick hearth. Carpet as fitted. Radiators. Exposed beams. Wall lights. Door to Family Room. Family Room 11'7" (3.53m) x 11'5" (3.48m) (3.53 x 3.47). Window to front. Carpet as fitted. Radiator. Exposed beams. Exposed brick chimney breast with recess and log burning stove. Wall lights. latched door to lobby. Lobby/Study Windows to front. Radiator. Latched door to cloakroom. Cloakroom Double aspect windows to front and side. Radiator. Pedestal wash hand basin. Low level WC. Vinyl floor. First Floor Carpet to stairs and landing. Skylight window. Linen cupboard housing hot water cylinder. Radiators. Exposed beams. Master Bedroom 18'3" (5.56m) x 11'4" (3.45m) (5.56 x 3.45). Double aspect windows to side. Exposed beams. Carpet as fitted. Radiator. Door to Jack and Jill bathroom. Jack & Jill Bathroom Window to side. Shower cubicle and power shower. Heated chrome towel rail. Low level WC. Pedestal wash basin. Wood panelled walls to dado rail height. Radiator. Wall cupboard. Bedroom 2 12'1" (3.68m) x 11'6" (3.5m) (3.68 x 3.50). Window to side. Carpet as fitted. Radiator. Door to jack and Jill bathroom. Exposed beams. Door to dressing room. Dressing Room Window to side. Sloping ceiling. Bedroom 3 11'6" (3.5m) x 10'6" (3.2m) (3.51 x 3.20). Double aspect windows to front. Carpet as fitted. Exposed beams. Radiator. Wall lights. A bank of fitted wardrobes with hanging space and shelving. Bedroom 4 13'7" (4.14m) x 6'11" (2.1m) (4.14 x 2.12). Tripe aspect windows to rear and side. Exposed beams. Wall lights. Radiator. Wood strip floor. Bathroom Window to side. Polished wood floor. Pedestal wash basin. Low level WC. Free standing claw foot bath with central mixer taps and hand-held shower. Shower cubicle with monsoon shower head. Heated towel rail. USEFUL INFORMATION We recognise that buying a house is a big commitment and therefore recommend that you visit the local authority website www.sevenoaks.gov.uk and the following websites for more helpful information about the property and local area before proceeding. Some information in these details is taken from third party sources. Should any of the information be critical in your decision making, then please contact Fine & Country for verification.